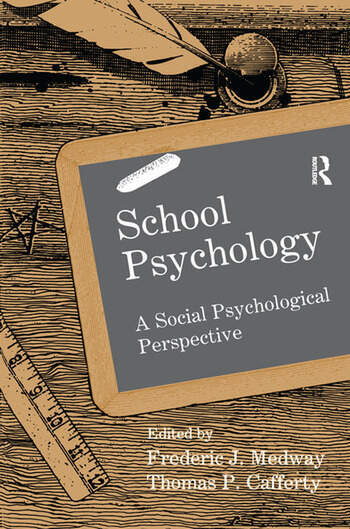 This impressive volume reintroduces the importance of -- and the contributions made by -- social psychology to school psychology. It provides an overview of the basic areas of social psychology (history, attitudes, attribution, attraction, and research methods) as well as the traditional school psychology functions (assessment, therapy, and consultation). To unite these two crucial areas, the editors and their contributors provide detailed discussions of specific educational and social issues such as substance abuse prevention and treatment, loneliness, cooperative versus competitive environments, and integration of handicapped and culturally different children. Based on classical, contemporary, and cutting-edge research and theory, this text should become an essential reference tool for all school psychologists. Contents: J.I. Bardon, Foreword. Part I:Theoretical Perspectives on Applying Social Psychology to Educational Practices. F.J. Medway, Rapprochement of Social Psychology and School Psychology: A Historical Analysis. T.P. Cafferty, Measuring and Changing Attitudes in Educational Contexts. M.J. Levesque, C.A. Lowe, The Importance of Attributions and Expectancies in Understanding Academic Behavior. G. Maruyama, J.M. LeCount, The Role and Importance of Interpersonal Attraction and Social Acceptance in Educational Settings. M. Henning-Stout, J. Conoley, Gender: A Subtle Influence in the Culture of the School. O.A. Barbarin, Family Functioning and School Adjustment: Family Systems Perspectives. R.J. Ilback, Organizational Influences on the Practice of Psychology in Schools. F.J. Medway, P. Skedsvold, Contributions of Social Psychology to School-Based Research and Evaluation Part II:Applying Social Psychology to Clinical Interventions in the Schools. D.S. Goh, R.K. Yoshida, The Influences of Social Psychological Variables on the Referral and Assessment of School Children. J. Sandoval, J.M. Davis, Applications of Social Psychology to School Counseling and Therapy. J.N. Hughes, Social Psychology Foundations of Consultation. M. Gettinger, Applications of Social Psychology to Learning and Instruction. K.J. Williams, G.M. Williams, Applications of Social Psychology to School Employee Evaluation and Appraisal. Part III:Applications to Clinical and Social Problems. C. Peterson, Learned Helplessness and School Problems. R.A. Johnson, J. Rose, D. Russell, Loneliness and Interpersonal Relationships Across the School Years. L. Chassin, C.C. Presson, S.J. Sherman, P.J. Curran, Social Psychological Factors in Adolescent Substance Use and Abuse. W.P. Erchul, Social Psychological Perspectives on the School Psychologists' Involvement with Parents. J. Weyant, Social Psychological Approaches to the Integration of Culturally Different and Handicapped Students in Schools. "...successful in addressing the overlap of the two areas of psychology across theoretical, research, and practical dimensions....The scope and quality of the text will appeal to readers from all areas of professional psychology. The text appeals as both a training resource and as an addition to one's professional library....the material is worth the price of admission."